Dan Bladen Founder, came up with the idea of Chargifi while he and his wife were on a 6 months tour of South America and India. “Have you noticed” Dan said to me that “Starbucks becomes the meeting point for westerners? You go to get some WiFi, charge your phone and get a cup of coffee”. And in that statement he had explained, Chargifi. Any smart phone owner (like me) is a slave to the cable. I have to carry one with me at all times and I know were all the power points are in the cafés I visit. Or lack of power points more likely! But let’s stop and think for a moment. Moving forward into the wearable market; watches, glasses, clothes are just around the corner. How will you charge them? The Motorola watch, for example, has no charge points. Chargifi – How Does it Work? 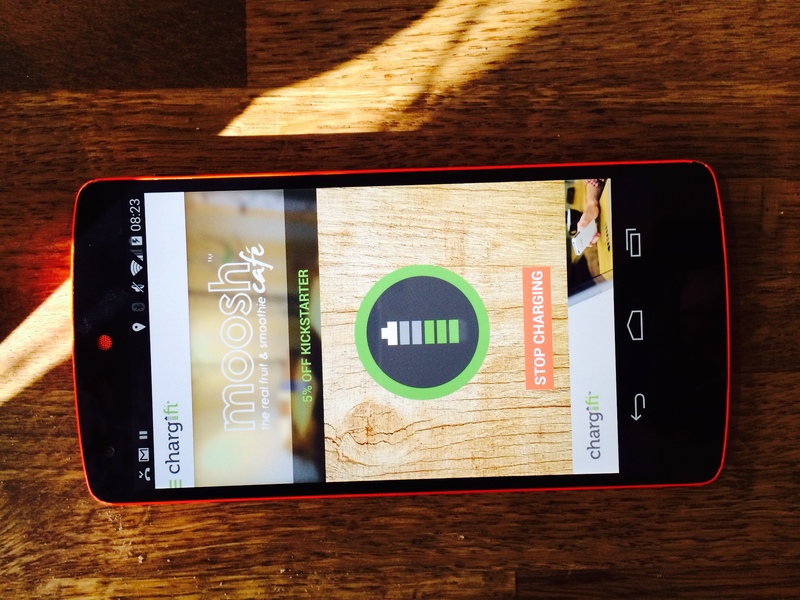 Chargifi is a charge spot on a table. Dan demoed it to me. I downloaded the app, (I have an iPhone so it needs an a credit card size adapter) inserted in the phone. 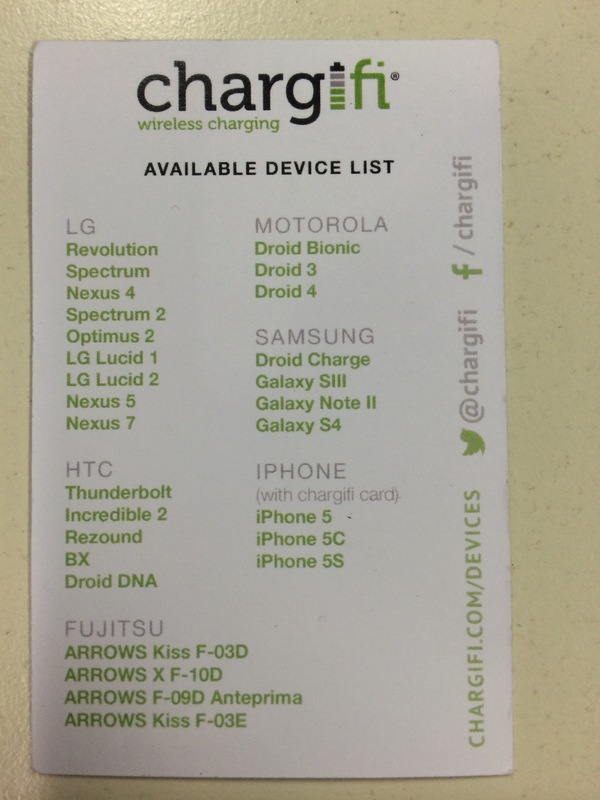 (Other phones, see list of supported phones do not need the adapter.) You place the phone on the charge spot, there is a start button on the app, press that and you start charging. As simple as that. You then either press the button again to stop charging or just walk away. If like me you are environmentally aware, then you will be relieved to know that the system will detect there is no phone and therefore switch off. No phone, no charge. For iPhone users the adpaation is a credit card size insert, cost is £10. Dan agreed this would be a sponsorship opportunity for a company to allow them to be sold for free. 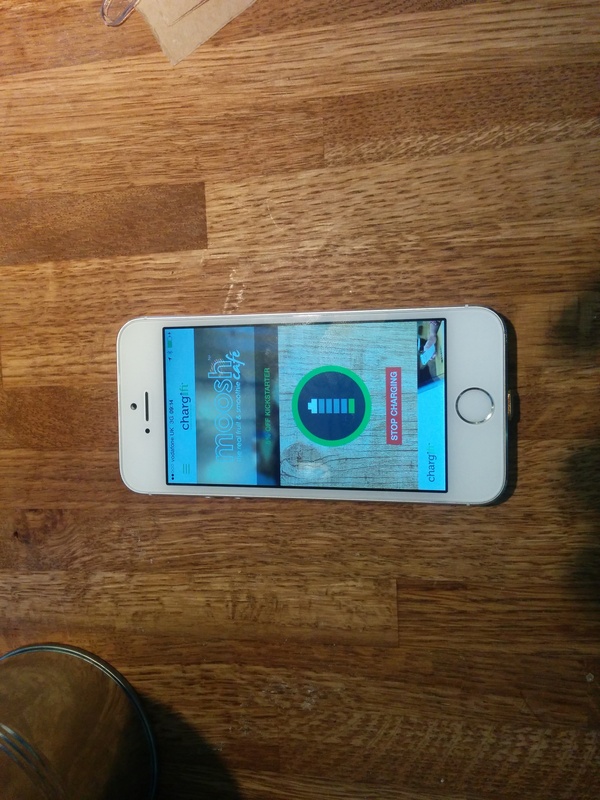 It is expected that the iPhone 6 will support wireless charging as standard. Business Plan – How Does Chargifi Make Money? For this to work, the phone has to be placed on the charge spot. The Business Model does require a person to put their phone down while in the Café and while I often Tweet and drink coffee, there are times I talk to people and put my phone down. Once you put your phone down the retailer has a platform! For example, phones can have localised messages pushed to them, offering to the customer coupons / special offers. The retailer can also sell on the ad time, for example, O2 might be offered a 4 second Ad spot when you leave. This Ad could cover the retailer’s costs, making the spot self financing. Benefits to the retailer is more footfall, increase in dwell time (this is sometimes good – I’ll come onto that) and the retailer gains insight of their customers. Retailers are able to push messages to their customers. The specials of the day or a room service menu, for example. Retailer may also want to push messages based on the time the person has used the charge spot. For example, if somebody has been on the charge spot for 20 minutes you can push them a 10% off a muffin offer. If this is not redeem in 10 minutes then you can switch the charge spot off. Each retailer gets a dashboard where they can see a profile of the customer using the Charge Spots. For example; male of a certain age, attended your cafe for a certain amount of time. You can also see the previous places they have visited. BUT (and Dan emphasized this) the use details, name, email are kept private. Before anybody writes to me and says how dare they share my data with anybody? Question: Did you really expect to get a charge point for your phone in convenient place for free? Dan describes this as “Fair Trade” data; you trade some anonymous data for the convenience of having a free charge spot for your phone. 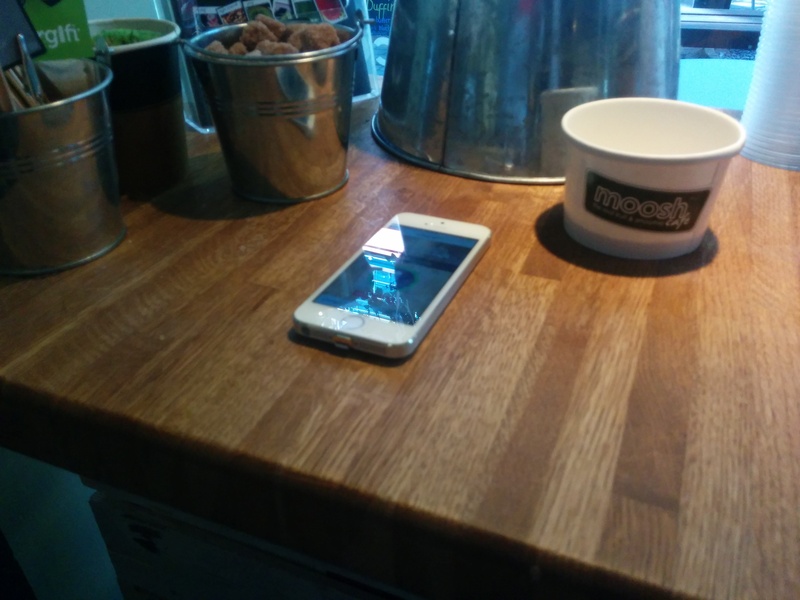 The obvious usage right now (I was sitting in Moosh In Carnaby Street charging my phone as Dan talked to me.) in Cafe’s, pubs, restaurants etc. Dan tells me that Hotels in Dubai are seeing this as a great “wow” way to provide added value to their customers. 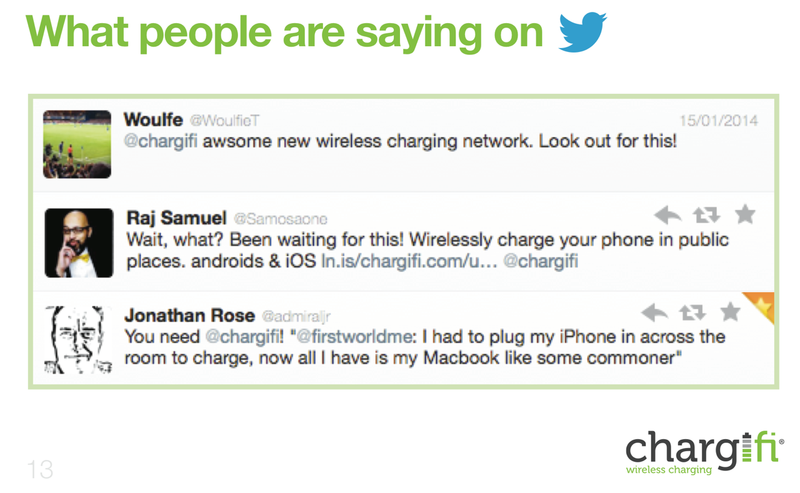 They see offering a chargifi spot on the best side table as a great customer experience opportunity. The room service menu could be pushed to the phone, for example. Dan explained that Chargifi is an app so can be standard independent and can adapt to any change in standard. Dan hopes that in October he is able to roll out charge points that go through thicker materials, this will enable charging multiple devices per spot. In a pub for example, a group of friends can all charge at the same time. Next year he hopes to roll out the ability to charge laptops and tablets. Dan said to me, “Wouldn’t it be great if you could turn up at any country without the need to know what power adapter, you need. Just put your phone on the bed side table and it’s charged.” I agree, that would take a lot out of the aggro of organising a holiday. To that end Chargifi have already sold licenses to operate Chargifi’s IP and brand in the UAE, India, Singapore & Hong Kong with plans to rollout in Russia, Malaysia and the US later in the year. While it’s early days, Dan has a clear road map for development and while things are still in early adopter mode, with the Internet of things (IOT) and wearables, there is a clear need to leave the cables at home and this is clearly a great example of the possible disruption to electric power provision ahead. Since writing this blog the US TSA have stated “Powerless devices will not be permitted onboard the aircraft. The traveler may also undergo additional screening.” There also has been major press coverage on the BBC, Sky and newspapers. As always the Devil is in the Detail and the current message from the US is that devices need to be charged 25% and above. Having the ability to charge phones etc at the airport while in transit could make a difference if you fly or don’t fly. On the basis you may have used the device on the flight you could be stopped making a transit and sent home. Dan points out that Chargifi could soon be available in a number of UK airports and in Dubai and already set to launch in Belfast City Airport in the next few weeks. 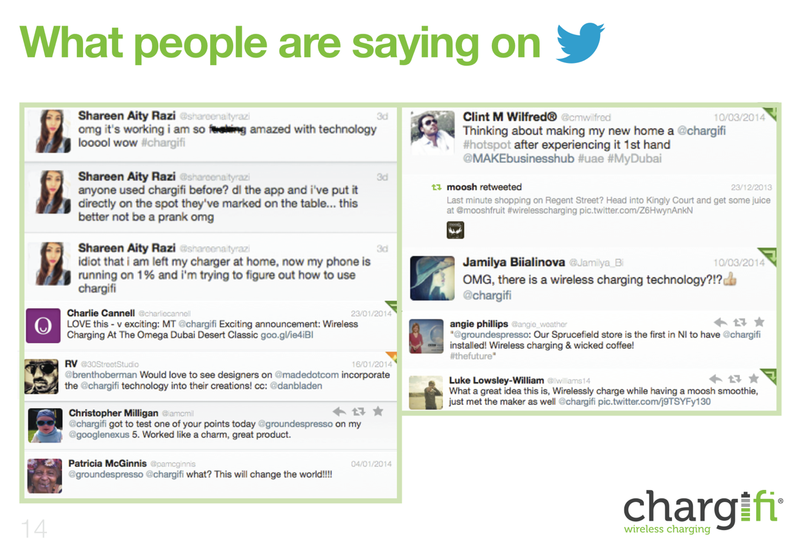 Some of the “buzz” on Twitter, this has been provided by Chargifi.